Thursday 11th April – Australian Market Wrap | Beeks Downunder-Because not all financial news is boring! ASX 200 falls 25 points to 6199 as banks splutter on BOQ results. US Futures down 1. Once again 6200 was tested today as the big four banking stocks came under pressure. Held but only just. Miners were in profit taking mode as BHP fell 0.6%, RIO down 1.3% and FMG down 1.9%. Defensives were in demand with TCL up 0.7%, pushing ever higher followed by SYD up 1.5%. Some movement at the station for TLS up 0.5%. CWN continued to find fans as a Wynn bid is seen as a better bet than Winx. Oh, and the election has been called. Enjoy the next five weeks. AUD firms slightly to 71.63c. ASX 200 down 25 to 6199. Trend is down. ScoMo calls 5 weeks of fun. Banks under fire after BOQ results. NAB predicts 20% housing falls from top to bottom. Iron ore miners see profit taking. Energy stocks gains as defensives find friends again. Asian markets mixed with Japan up 0.08% and China down 1.58%. WHC +0.25% falls then rallies on production numbers. CIA +3.59% iron ore price rises. Z1P +6.44% continues to push higher. JIN +1.81% jackpot time again. BOQ -4.89% results underwhelm. Every measure is falling. CVW +8.59% CBA becomes substantial shareholder. Speculative Stock of the Day: Avita Holdings +19.70% huge volume and a meteoric rise in last month. Dragging Polynovo (PNV) +2.31% with it. Biggest Falls: AMI, BOQ, API, ORE, SGM, NWL and WPP. Challenger (CGF) -0.39% Sells $200m tower at 31 Queen St, Melbourne to AEW Capital. Netwealth Group (NWL) -4.63% Provides Q3 update; reports FUA up 1.3% quarter on quarter to $21.05B. Whitehaven Coal (WHC) +0.25% March quarter production report. Quarterly ROM coal production down 17% on year to 4.9Mt. Managed Saleable coal production down 2% on year to 5.1Mt. ROM coal production for FY19 is expected to be between 21 and 22.8Mt vs previous guidance of 22 to 23.2Mt. Expectations for the cost of coal (excluding royalties) remain unchanged, anticipated to be around $67 per tonne. Insurance Australia Group Limited (IAG) -0.26% Has confirmed it has had a proceeding filed against them in the Federal Court of Australia against it and its subsidiary, Swann Insurance.IAG said it would update the market as it receives more information. Amcor (AMC) +1.30% One step closer toward closing its buyout of US-based packaging company Bemis. The AMC and Bemis merger received unconditional antitrust clearance from Brazil. The transaction does however remain subject to regulatory approval in the United States, Amcor says the companies are in advanced discussions with the US Department of Justice. Cimic (CIM) –0.51% AGM today. CIM is upbeat on the outlook across its core markets with Net Profit After Tax (NPAT) for 2019 expected to be in the range of $790 to $840m. Westpac (WBC) –1.27% Is cutting interest rates across three, four, and five-year products for owner-occupiers who pay principal and interest by up to 0.2 percentage points. Matching CBA’s move earlier this week. The ANZ-Property Council’s latest survey for the June quarter showed that a further decline in sentiment had put confidence at its lowest level since the survey began in 2011. The largest decline in confidence came in New South Wales. The futures market is now implying a cash rate at the May meeting of 1.47%, equivalent to a 12% probability of easing. Chinese inflation lifts to 5-month high in March of 2.3% matching consensus. Consumer prices rose from 1.5% to 2.3%. Non-food prices up from 1.7% to 1.8% Producer prices rose from 0.1% to 0.4%. Tencent hits a 9-month hit on new game approval. Exports from the Philippines fell for a fourth straight month in February. Indian elections kick off soon. Largest democracy in the world. Not a headline you see often, Deadly Super Fungus Fuels surge in Chinese drug maker shares. ‘Candida Auris Fungus’ is ‘roaming the globe’ and is a hot topic in China now. There is no cure for the fungus but it hasn’t stopped punters from piling on. Shandong Sinobioway Biomedicine Co. has rallied 33% in the past three days. Equally silly is the Chinese markets reaction to the first pictures of a Black Hole. 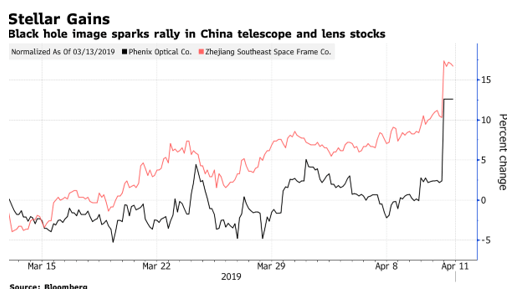 Companies that make space telescopes and optical lenses got bought up. Plain silly. Hard to believe that Chinese stocks market is capped at US$7 trillion. More problems for Boeing as 737 crashes seem vulnerable to failure. A symbol of US pride is well and truly on the nose. Meanwhile in Brexit land, the UK has been given a new deadline, Halloween. Seems appropriate for this horror show. The OECD has warned that the middle class faces the triple threat of tax, robots and falling house prices. Sound familiar? Police update : The local supermarket was robbed last night, thieves made away with 500 cans of Red Bull. Honestly, I don’t know how they can sleep at night. I was admitted to hospital at the weekend for minor surgery. I asked the Doctor if I could administer my own anaesthetic. He said “Go ahead mate, knock yourself out”. Dire Straits are opening a cafe at the end of my street. They’ll take money for muffins, but the chips are free. I see the Japanese are building a campervan specifically for opera lovers: the Nissan Dormer.